The limbic system manages a range of emotions and contributes to the processing of memory and smell. A little while ago, we virtually dissected the outer structures of the brain using Human Anatomy Atlas. Need a review? Go back and read (or watch) it here. It’s okay, I’ll wait. At the anterior base of the brain, we’ve got the good old hindbrain. And by old, I mean old. It's been suggested that it first evolved from the Urbilaterian, the hypothetical last common ancestor of chordates and arthropods, somewhere between 555 and 570 million years ago. 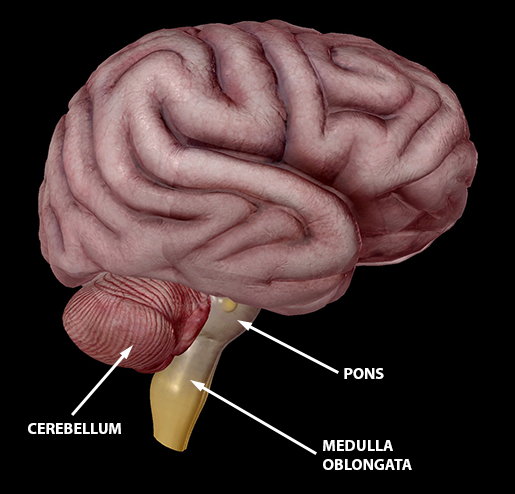 The hindbrain includes the cerebellum (which fine-tunes movement, manages balance and posture, and even does some problem solving when the mood is right), the pons (which act as a bridge between the brain and spinal cord, conveying signals via white fibers), and the medulla oblongata (which controls functions for digestive, respiratory, and circulatory systems, and contributes to hearing, balance, and taste). Within the region of the forebrain is the cerebrum, which is the largest part of the brain. With four lobes and two cerebral hemispheres (aka, your left and right brain), the cerebrum is probably the structure you imagine when you think of the anatomy of the brain. 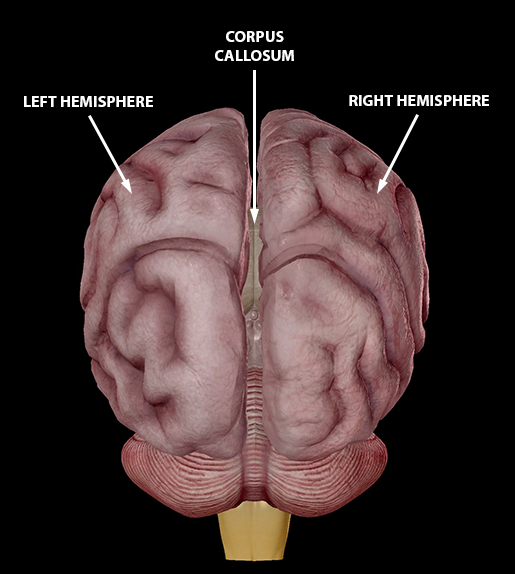 The two hemispheres are neither symmetrical in shape nor function, but they communicate via the corpus callosum—a central white commissure shaped like a broad, arched band—which crosses the midline of the brain, connecting the corresponding gray matter regions of the two hemispheres. As a whole, the cerebrum is responsible for voluntary action, conscious thought, decision making, and activities including speech, some sensory perception (smell and taste), and memory. All caught up? All right, let’s dive in and take our brains apart even more—metaphorically, of course. Yikes, stop watching so many serial killer shows. The midbrain, another primary region, is a short, constricted region connecting the pons to the diencephalon that is involved with vision, hearing, motor control, alertness, and thermoregulation. It’s connected ventrally and laterally to the cerebellum via the cerebral peduncles, two cylindrical structures containing nerve tracts through which information is passed between the hindbrain and forebrain. The anterior portion of the cerebral peduncles are the cerebral crura (sing: crus), which contain the descending (motor) tracts. 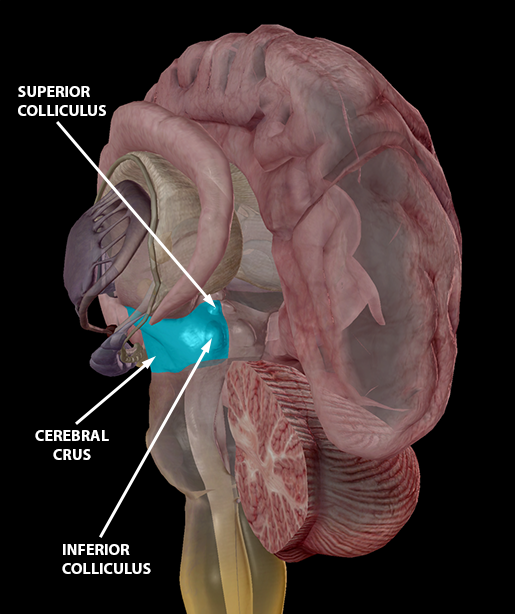 The midbrain also consists of the corpora quadrigemina: two large, paired nuclei that are divided into the superior colliculus (which controls visual reflexes) and the inferior colliculus (which controls hearing-related reflexes). The diencephalon is located inferiorly to the corpus callosum and a fold of pia mater (connective tissue). It is anteriorly connected with the cerebrum and posteriorly with the midbrain. It’s made of three structures, each of which has specific functions. The thalamus relays information between the brain stem and the cerebral cortex. Surrounding the thalamus is the basal ganglia, a group of nuclei that regulate body movements by processing sensory and motor information coming from the cerebral cortex. Included in the basal ganglia are the caudate nucleus, the putamen, and the medial and lateral globus pallidi. 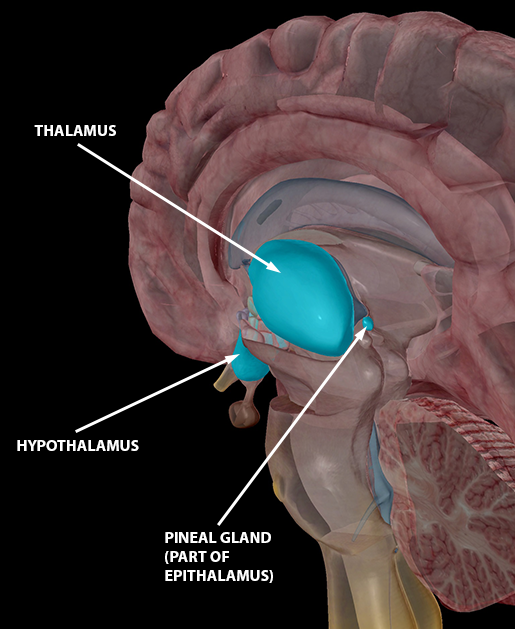 The epithalamus contributes to the function of the limbic system, and consists of the pineal gland (also known as the pineal body). It secretes melatonin at varying levels throughout the day, contributing to the regulation of the diurnal cycle and our body’s circadian rhythm. The suprachiasmatic nuclei in the pineal gland is often referred to as “the biological clock.” Interestingly, the pineal body serves as a useful landmark as it consists of follicles containing materials that make it easily identifiable on an X-ray. Throughout all these regions, the ventricles of the brain form a network of cavities filled with cerebrospinal fluid. 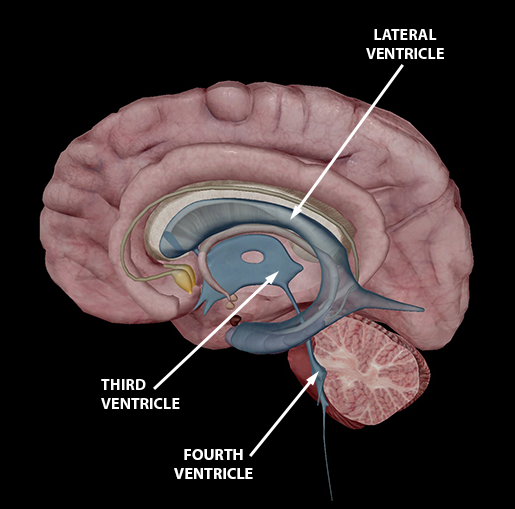 The two lateral ventricles in cerebrum—one in each hemisphere—connect to a third ventricle in the diencephalon, which, in turn, connects to the fourth ventricle in the midbrain. This fourth ventricle continues down into the medulla oblongata and eventually merges into the central canal of the spinal cord. The cerebrospinal fluid, which is produced in the choroid plexus of each ventricle, travels through this system from the lateral ventricles to the spinal cord, transporting nutrients and wastes, providing support for the brain, and protecting the brain against trauma. What’s the limbic system, you might ask? Well, it’s basically a whole collection of structures that manage a range of emotions and contribute to the processing of memory and smell. It’s located on the inner border of the diencephalon, and its structures form a pair of rings between the two cerebral hemispheres. If you read the other piece before coming here, you might remember we talked about the precentral gyrus and postcentral gyrus, which are between the frontal and parietal lobes. Gyri are convolutions or folds on the surface of the brain that increase the cerebrum’s overall surface area, thereby increasing the number of cerebral neurons and the amount of gray matter. 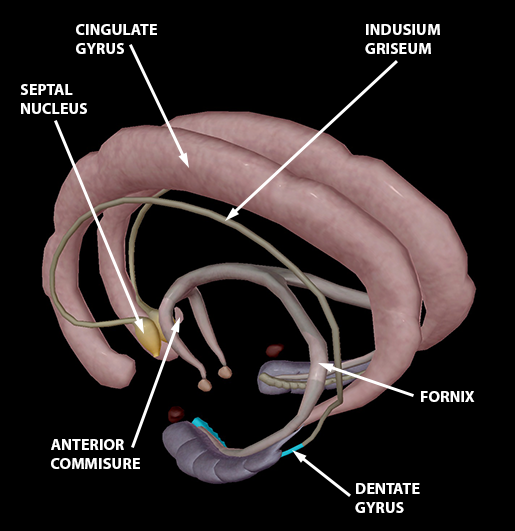 Unlike the other two, the cingulate gyrus is an arch-shaped convolution close to the corpus callous and the first structure of our limbic ring. It plays a role in expressing emotion through gestures. The fornix, the anterior commissure, and the indusium griseum are fiber tracts that link the limbic system. On the anterior end of the indusium griseum is the septal nucleus, a group of gray matter patches found in the thin membrane that separates the cerebral hemispheres. It’s involved with feelings. On the posterior end, we’ve got the dentate gyrus. A narrow band extending downward and forward above the hippocampus, it contributes to memory and possibly depression. 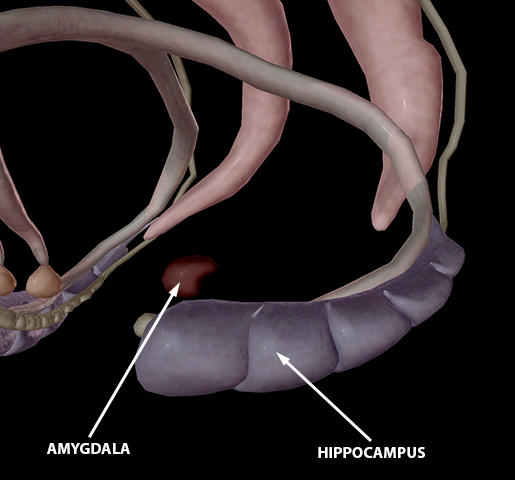 The hippocampus is a C-shaped structure within the medial temporal lobe. It’s mostly made up of gray matter with a ventricular surface that is covered by a thin layer of white matter. It plays a role in the consolidation of long-term memory. The amygdala is an ovoid gray mass located in the anterior surface of the hippocampus. It is involved in memory and emotion, and the linking of the former to the latter. And that’s a wrap for now! The brain is so complex, we’ve only just begun to understand how vast and complex the workings of the brain are. Still, now that we covered some of the major brain sections and their functions, hopefully our brains know a bit more about themselves!